Recalls happen. I know that they do; I’ve been writing about various consumer product safety recalls for years. Until now, the only experiences I’ve had with consumer product safety recalls have been with things I’ve bought for my kids: our Phil & Ted Sport stroller was recalled (and quickly handled by the company) and, more recently, our Bumbo seat. I’ve never had a recall impact my dinner plans before. Yesterday, I was enjoying some quiet time with no children. They actually took a nap at the same time, so I was able to enjoy a bit of downtime with no one climbing on me. The phone rang, and I quickly snatched it up before Eudora (who may very well be the world’s lightest sleeper in the baby category) woke up. I heard a recorded message. Usually I hang up on those, but this time I listened. Costco (Canada) had put out a recorded call to their customers who had purchased ground beef within a certain date range. There had been some concerns about E. coli in their hamburger meat. Although none of their hamburger meat had tested positive, there was still a very small chance of contamination. There had been no reported incidents related to their beef. Consumers had the option of returning their meat to Costco for a refund. Well, crud. I had thought I’d do a simple shepherd’s pie for dinner, but that phone call put the kibosh on that. I’m not even remotely willing to take the chance (no matter how slight that risk may be), particularly when I feed that meal to my toddler. It ended up being a grilled egg and cheese sandwich for dinner instead. I’ll call Costco today to ask if I can get a partial refund, in spite of the fact that the hamburger meat has been separated and some of it has been consumed. Either way, it’s going to be leaving my freezer today. What I found interesting was that in that phone call, safe handling practices of ground beef were mentioned. I figured that it was something that everyone knew; they were probably just covering their bases. Just in case it’s not, though, here’s some safe practices for you. Obviously, you should always wash your hands before touching your food for prep. 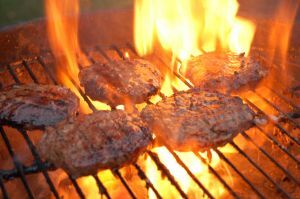 Ground beef should be cooked up to a minimum internal temperature of 160F. You should not put your cooked beef back in the same container or on the same surface as raw beef due to concerns with cross contamination. Wash your hands frequently while cooking in order to prevent cross contamination, too. When storing ground beef, it’s safe in the refrigerator for two days. Any longer than that and it needs to be frozen in order to prevent bacteria growth and spoilage. Did you receive the call from Costco yesterday? hey sweetie, just stopping through! cute website! nope no call here as i don’t really shop there…too far away for me lol and i try not to eat too much red meat unless i have one of those days where i’m cravin’ a burger =))) glad you guys are doing well and no e coli problems…that’s just awful >.< have a good day!